Canada is 14th among 149 nations in the fourth annual Global Peace Index issued by the Institute for Economics and Peace in Australia. 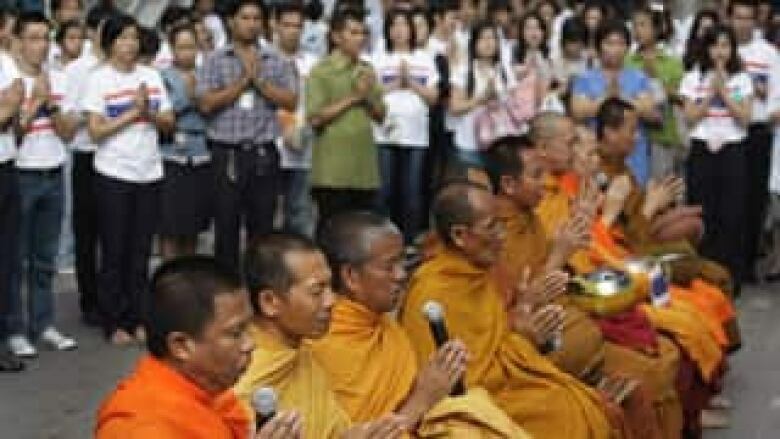 Buddhist monks pray for peace in downtown Bangkok, Thailand, on June, 5, 2010. ((Manish Swarup/Associated Press))Canada is 14th among 149 nations in the fourth annual Global Peace Index issued by the Institute for Economics and Peace in Australia. The think-tank said the world is a less peaceful place this year, largely due to a rise in crime and civil unrest fuelled by the global financial crisis. But the Sydney-based institute also said the risk of outright armed conflict appears to be falling. The index is based on 23 indicators, ranging from military expenditure to relations with neighbouring countries and levels of violent crime. New Zealand earned the top spot in the index for a second year in a row and is one of only three countries in the top 10 to improve in peacefulness in the 2010 index. Iceland moved into the second spot, followed by Japan, Austria, Norway and Ireland. Iraq is 149th and last, just below Somalia and Afghanistan. The United States was 85th, slipping three spots from last year due to the addition of new countries and the re-rating of the number of heavy weapons. The annual report said South Asia saw the greatest drop in peacefulness, largely due to increased involvement in conflicts,more deaths from internal conflict and human rights abuses. Western Europe continues to be the most peaceful region, with the majority of the countries ranking in the top 20. All five Scandinavian nations rank in the top 10. An earlier version of this story incorrectly reported the home base for the Institute for Economics and Peace. It is based in Sydney, Australia.